Want Free Access to Yvette Mimieux Pics & Clips? The magic of Yvette Mimieux's name evokes the exotic allure of far-off places, a rich, sensual resonance of old-world charm and wiles. Is she from the glittering lights of Paris? The mysterious alleyways of Marseilles? Hardly. She was a hometown Hollywood girl, discovered when a motion-picture press agent's helicopter made an emergency landing out in the scrubs where Yvette was horseback riding. The petite French/Spanish hybrid shot to fame and the national libido portraying the innocent, free-loving future girl Weena, who always looked one shimmy from falling out of her toga in The Time Machine (1960). 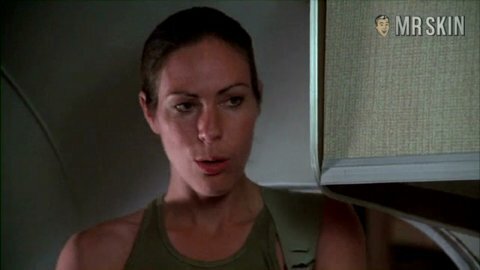 Although Mimieux could always be counted on for an erotically charged screen presence, her only true exposure occured during an altercation with a horny guard in Roger Corman's overcooked, overlooked classic Jackson County Jail (1976), which, contrary to expectations, failed to provide the requisite shower scene.